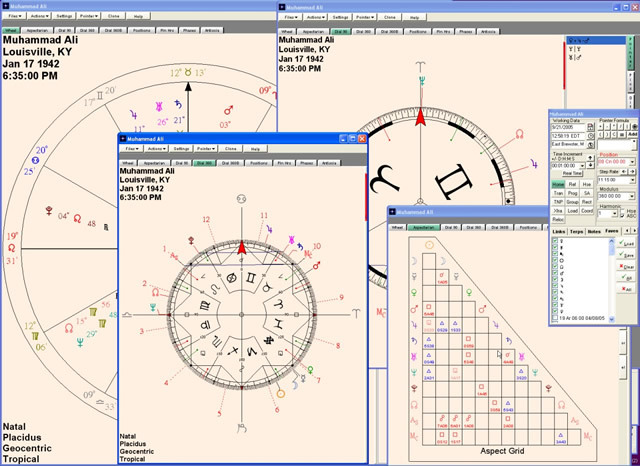 Using Nova Chartwheels for Windows ushers you into a new world of astrological computing. With its cutting edge design, technical excellence and brilliant implementation of astrological techniques, Nova Chartwheels is uniquely positioned in the astrological software marketplace. The high precision calculation routines in Nova Chartwheels are based on Robert Hand's venerable Nova and Chartwheels programs released in the 1980s. However, everything has been updated and added to during two decades of additional work and utilizes the greater graphic possibilities available for the Windows operating system. Nova Chartwheels provides a highly interactive environment that allows you to manipulate on the screen what you previously did on paper. In short, Nova Chartwheels works the way you do - and lets you investigate a chart with ease and spontaneity. The first difference you'll notice is our video documentation feature. From installation through feature use, follow along with videos created by Nova Chartwheels designer Gary Christen and programmer Ray White. 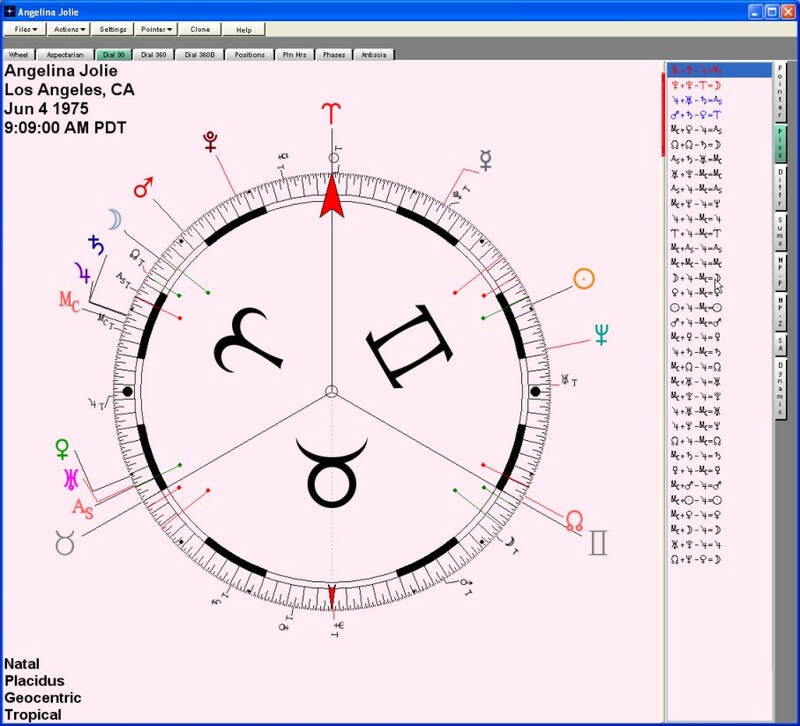 Nova Chartwheels allows you to cast charts using a variety of zodiacs, coordinate systems and house systems. There are also a multitude of progression rates to please even the most technical sidereal astrologer. Nova Chartwheels also offers you the ability to save time by calculating subsidiary charts along with the natal. And, tech support is available through our online forums, where you can get help and share your experiences with our staff and other Nova Chartwheels users. There's so much that you can do with this program... yes, there are the usual transits, progressions, returns and synastry features that you'd expect in any astrological program. But, in Nova Chartwheels, they are uniquely implemented. Want to look at a composite chart between two people? Just drag one chart into the other and, in an instant, the composite is calculated. Or, if you suddenly have the desire to look at a solar return for your client, just drag the Sun into the pointer and you'll have it. Do that again for the following solar return and so on. Hit home and you return back to the natal chart. If you work with midpoints and symmetrical astrology techniques, this is the program for which you have been patiently waiting. No program makes it easier to thoroughly and accurately investigate midpoint and three planet pictures. The dials in Nova Chartwheels are precise and those familiar with dial techniques can now time events with absolute accuracy. But there's more... Use our unique aspect inspector to look at everything that's happening between two planets or a planet and sensitive point. You can also look at multiple coordinate systems at the touch of a button and employ other single button commands for complicated tasks. 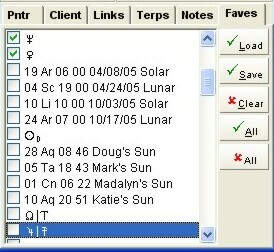 Make your own set of favorite points "faves" that can include the positions of eclipses, sensitive points in your chart, fixed stars, etc. and then upload them with the touch of a button. 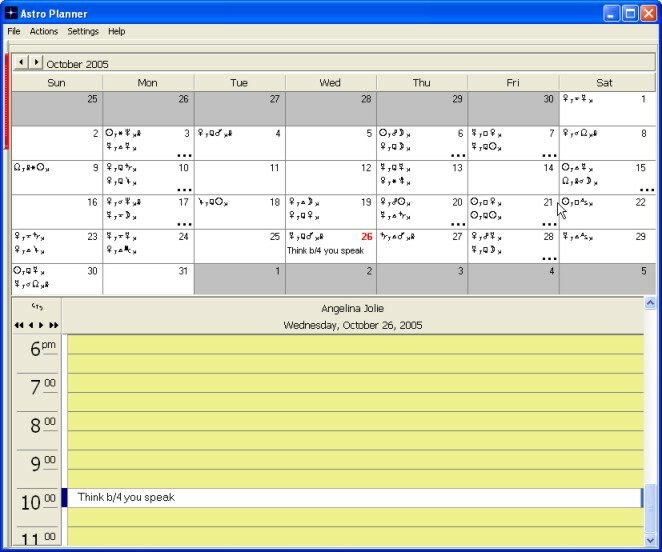 There's a complete AstroPlanner that synchs with Palm Pilots and Outlook and creates a personal calendar that you can print out. And, you can associate or link other charts with one chart so that you have instant access to those charts at a moment's notice. If this isn't enough to set Nova Chartwheels apart from any other program, wait until you check out the client management features. Beyond keeping notes on your client, you can keep track of how much time you spend working on their chart and create an invoice. But, Nova Chartwheels' crowning glory is its implementation of multi-media extensions. At the touch of a button, you can make an MP3 recording of your consultation to send to your clients. Or, use the video screen capture with your voice for consultation or teaching. Easy chart data entry lets you cast subsidiary charts along with the natal chart. Free-form design fits the way you work. Just clone a chart to create different windows showing it simultaneously as a regular wheel, 360° dial, 90° dial, aspect grid, etc. Arrange different chart views and charts on the screen in the way that feels natural to you. Each wheel or table is in its own window, so that you can lay out charts on the screen much as you would the papers on your desk (except that they stay more organized on the screen). To bring a different wheel, listing, etc. to the top, just click on the appropriate wheel window, tab or control button. Sharp, professionally designed dials can hold multiple charts simultaneously and make it easy to detect symmetrical patterns, including patterns between charts. For precision, you can consult midpoint, planetary picture and other listings at the side. 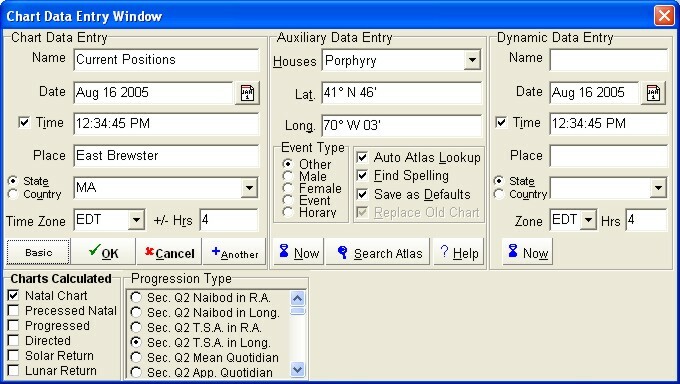 The unique Aspect Inspector window revolutionizes predictive work. Select any pair of points, and it shows the aspect (if any), the exact arc opening, and any other pairs of points that have the same opening. Plus, within the timespan you specify, it shows all transiting and progressed aspects between those points, the dates when solar arcs will connect the two points, and the times when the two points will repeat their natal arc opening by transit. You can click on any of these items to see a full chart for the event. The Working Data Window is like a master control panel, enabling you to instantly access a huge variety of information on the chart whenever the need arises. Just change the Working Date (top left), and the transits, progressions and solar arcs in all open charts and listings will automatically update to that instant. Create files of your favorite sensitive points for particular issues, and keep them ready on the “Faves” tab to add to any chart. 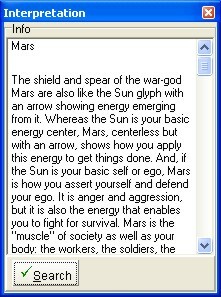 Keywords for planets, midpoints and planetary pictures are provided to start your interpretations flowing. 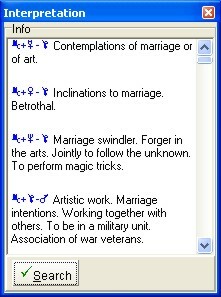 You can even search the database for phrases like marriage, financial success, childbirth, etc. to find the appropriate planetary pictures. The built-in professional astro planner includes a nice to-do list, daily schedule and address book--plus a printable monthly calendar that can show the transits to your own or a client’s chart. You can even use it to make comments about the quality of the day for your clients. Solar Fire has many features that are not in Nova Chartwheels. However, with its extensive client management facility and its fast, direct way of working, Nova Chartwheels is a powerful productivity tool for busy professionals. It is also the ultimate tool for astrologers who want to get precise, concrete results through the special power of midpoints, planetary pictures and other types of astrological symmetry. This powerful program demands the best. We recommend at least Windows 8; 1G RAM; 1200 mHz Pentium, Centron, Athlon, Duron or Sempron chip; display at least 1024x768 (1248x1024 and a 17-inch screen recommended for desktops); CD ROM drive; CD or DVD burner; microphone; and an internet connection for emailing readings and accessing program updates and forums. Nova Chartwheels will run on all Microsoft-supported versions of Windows, except as noted below. Older versions of Windows are NOT recommended. Windows 8 RT and Windows 10 S do not run Nova Chartwheels. ... But other Windows 10 and Windows 8 versions work perfectly well! As of 5/1/12 Nova Chartwheels version 0.980 has been extensively beta-tested, and it includes a printed quickstart manual and preliminary audio-visual instructions. Buying it at the pre-release price entitles you to all version 0 and 1 upgrades as they become available; to free personalized technical support on installation questions; and to other support via the Nova Chartwheels online forum. * Now with a built-in ACS Atlas, it is no longer necessary to purchase the Atlas separately. Nova Chartwheels with the built-in Atlas is now available on CD or as a download (downloaded programs are not refundable). Want to Order by Mail?